I could not get enough of your photos! These flavours are so out there but I simply have to try it! Mussels are not my seafood of choice but could I use tiny clams here? I read this as “honey beer”, which would obviously work as well. What kind of beer did you end up using and what would you recommend as good options? Normally I’d stick to the tried and true white wine, garlic, and butter type preparation, but I’m curious as to how this turns out. That’s the one thing I can get my kids to eat ,beside chicken nuggets!? Go figure. I’m off to the fish market!!!!! Snacky dinners are just the best. 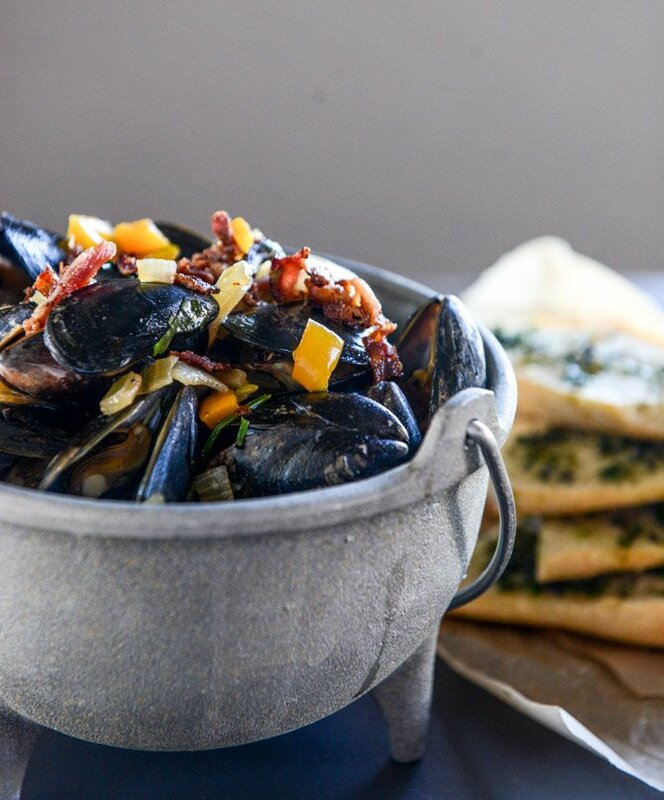 The more munchies, the merrier, especially when mussels + bread + beer + bacon are involved! These photos are everything. Mussels are on my to-do list for 2015, and I may have to give these a shot. They look so good! These look absolutely delicious (there, I said it too). GORGEOUS photos. I absolutely cannot have mussels without some sort of carb for dunking. Those baguettes…dear LORD. Good grief that sounds amazing. Mussels are already good but steaming them with beer , bacon and honey? Genius! I am making bacon-wrapped shrimp, tahini-glazed chicken wings, and mini brownies with salted caramel frosting. Also, maybe these mussels!!! Snacky dinners hold a special place in my heart. Especially when there’s mussels. And beer. And bread. OH MY! I want to come to your dinner party! These look fab! I’ve never actually made mussels but I’ve been dying to try them! I freaking love everything you do. These look amazing! Mussels and french fries are so good but I would totally swap the fries for the bread. This meal never seems like much but I always leave satisfied. Well, at least we can agree that I’d like you to cook me a snacky dinner too! I just had a couple of good friends over for a “delicious” snacky dinner…even better was that there were leftovers for another snacky dinner the next day…So I’m up for this delectable meal…perfect for a Friday night! I’ll be right over!!! YUM! Oh my gosh, I die! I need this in my life. Somebody, please bring me some mussels! I made this last night for my boyfriend and his parents and it was a HIT! I’ve never made mussels before, but they were delicious. The only change I made was adding some shrimp. The broth was delicious, we were all sopping it up w/ the tasty herb bread. Perfect mixture of briny and sweet. I made this w/ your Roasted Corn Caesar Salad, which was also tasty.